In the run up to Valentine’s Day we asked Nick Andrews, Business Development Director with Sequel Group, for his thoughts on office relationships, and offer you the chance to win a delicious box of chocolate brownies from ‘baked & boxed’. Office relationships are certainly a subject that provokes a lot of discussion and a quick straw poll of colleagues shows opinion is divided. There are those who agree that combining home life with the morning commute does nothing for a relationship. Others argue that deeper, longer lasting relationships are forged when a couple spend more time together. As someone who met his wife at work (we have now been married 16 years) I will declare an interest. In my experience the trials and tribulations of daily working life tended to bring us together. And there is scientific research to support this view. According to a study released last autumn, couples who meet at work are more likely to marry and enjoy longer lasting relationships. In contrast, those people who meet at the pub or on holiday are more likely to have short-term flings. The study was carried out by the makers of ‘How I Met Your Mother’, a popular US television show, where 2,000 adults were questioned. A spokesman for the survey said: “We spend so much time at work that it’s inevitable you will form close friendships that may go onto become a relationship further down the line. The reactions to this survey (and other similar articles) online were interesting; while several people agreed with the results – many had started families with their partners – others said they found work more difficult. This was particularly the case when the couples worked closely together physically (i.e. in the same small department) or often attended the same meetings. Some employers, of course, actively discourage the concept of couples working together, often citing confidential information as a barrier to effective practices. There are also plenty of examples of relationships which go wrong and impact colleagues in the process. But working for a range of clients as we do here at Sequel, we’ve found that many blue chips – while not actively encouraging romantic ties between employees – are relaxed about the issue. Indeed, in the run up to Valentine’s Day, a popular feature is one which focuses on those couples who met at work and consequently tied the knot/had babies/lived happily ever after. I guess this says much about the culture of those organisations – are those that are truly social, open and honest have a better working atmosphere where people are free to do what they want? And do the more traditional, autocratic organisations foster a culture of fear and secrecy? It’s a debate which will, of course, run and run. And perhaps there isn’t a right or wrong answer. What do you think? Is living and working together beneficial to a company? What challenges does an open culture pose to communicators? Please post your comments below. 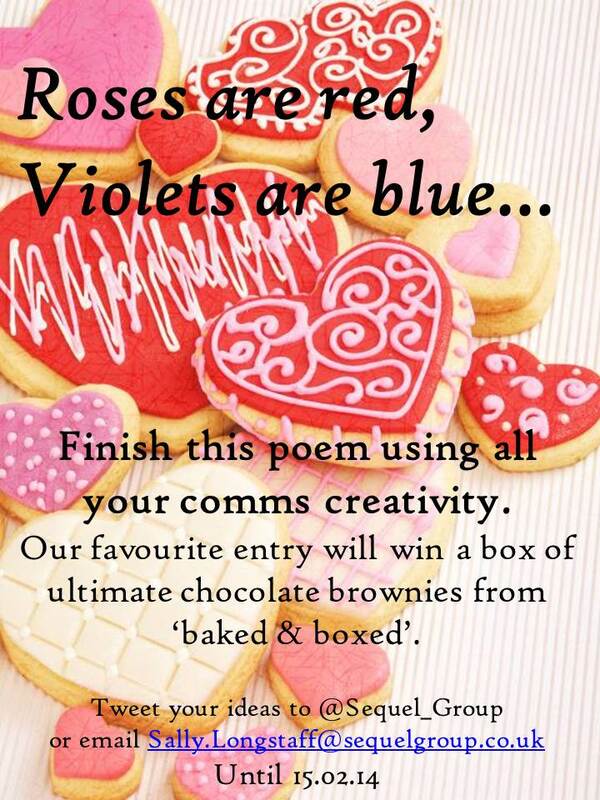 And don’t forget to get involved in our competition to win a box of brownies from baked & boxed – just finish the well-known poem ‘Roses are red, Violets are blue…’ using all your comms creativity and email Sally Longstaff or tweet your answer to @Sequel_Group.